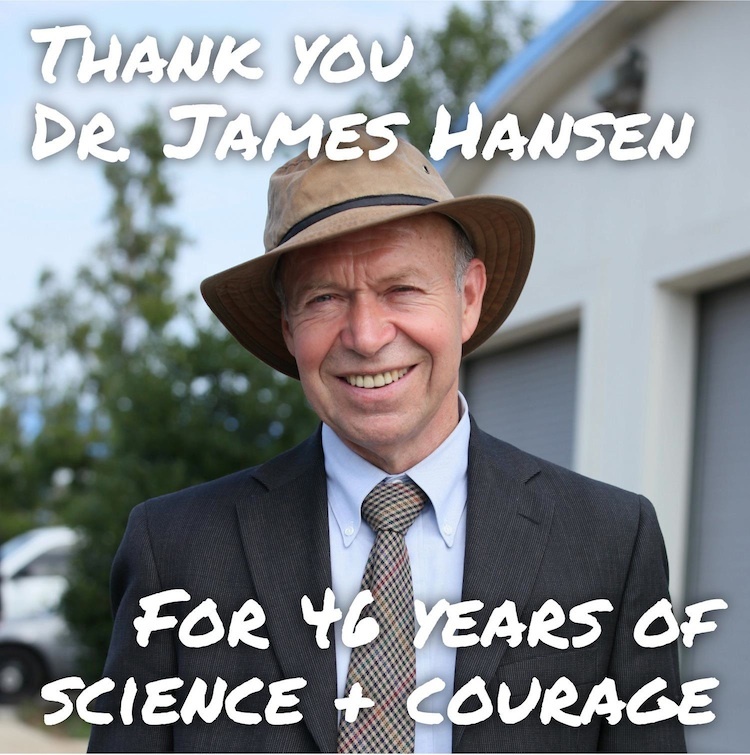 350.org is honoring Dr. Hansen for his leadership across 4 decades of climate change. A giant among scientists for taking on the burden of the most controversial and essential science in history. He faced down congress, faced censorship, and faced religious leaders in a race against time to save the world. And he never stopped working to advance knowledge. Our survival, and the survival of life as we know it, hinges on how quickly we learn to respond to the evidence that we are digging our own graves when we dig up fossil fuels. We create our own ruin, and only together can we stop it. Yet we debate, deny and ignore the work of this man and a generation of scientists that he inspired around the world who are trying to help us save ourselves. Thank you Dr. James Hansen for a career of public service that predicts (and might still change) the course of history on earth. We owe a moment of pause to thank the man who more than any other one person has furthered the science and helped the world understand what climate change is, what it would do, and what we must do to avoid the very worst before it happens. Because of his dedication and skill, now we know: Stop using fossil fuels, Change the history of Earth. Take a trip to NASA’s website to explore the amazing work Dr. Hansen guided. Consider how much this man has done to further our understanding of our only home, to make us all more aware of how our destiny rests in our hands. In his career, Dr. Hansen taught us about climate tipping points. But lately he’s been describing a “human tipping point”. Here’s hoping his work was not in vain, that you and I will take up his call to urgent action, and that we will work tirelessly to stop using fossil fuels and reach the “human tipping point” in time. We can still abandon this human-caused mass extinction event, driven by an insatiable ship of fuels. But we have to do it today. Sign a petition today in honor of Dr. James Hansen demanding the State Dept reject the Keystone XL pipeline, a fitting tribute for a man who was arrested twice in front of the White House demanding a stop to the pipeline. Read his Op-Ed in the LA Times on April 4th to preview what Dr. Hansen plans to do in “retirement”. Dr. Hansen certainly did his best. Now it’s up to you and me. All across the nation this week, activists like you will stand up to the companies that profit from building the Keystone XL pipeline. Stay engaged and find a blockade action you can support! Every voice counts. Make yours loud and clear. Show up for an event this week! Follow the link to Tar Sands Blockade where you will find the actions map. Learn how you can support local groups to stop the Keystone XL Pipeline during this national week of action. Dr. James Hansen states that if the pipeline is approved, it’s “game over” for the climate. If we want to sustain life on earth, we cannot afford to burn the oil and gas we already drilled, much less if we speed up strip-mining this filthiest fuel, and build new infrastructure to burn more of it faster. Look at these photos of Alberta tar sands mining. This is the stuff we use to drive cars now? It’s easy to imagine why this carbon-dense bitumen mining really will tip us over the edge, unless we do everything we can to stop it today! 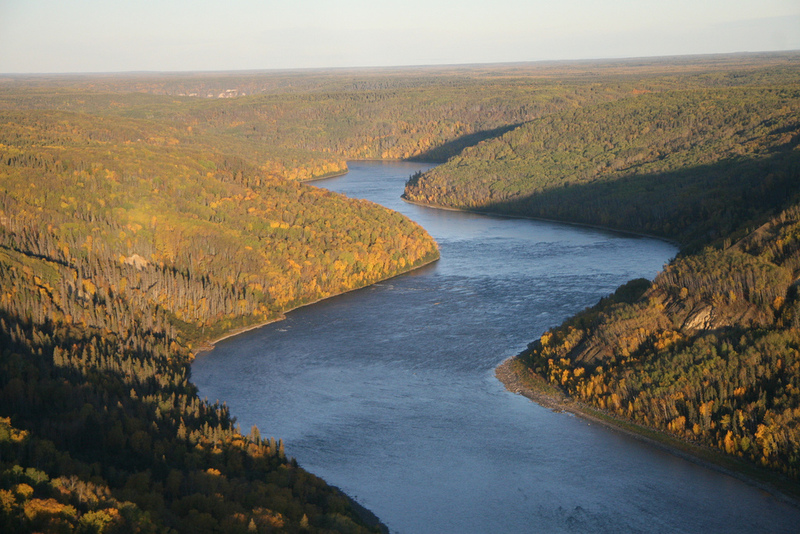 The Athabasca River in Canada, one of the world’s largest wilderness watersheds, and now home to Tar Sands strip-mining, shown here as it has been and will be for thousands of years. If we will only leave the tar sands in the ground.